SATELLITE MOTORS- WHAT IS ALL THE FUSS? Satellite motors allow TV / Radio / broadcast feed & Data reception from multiple satellites, moving automatically to the satellite the channel is on, instead of just being on one satellite & only accessing it's much fewer number of channels & that are often locked. In the UK for example, there are over 400 channels transmitted free from UK TV companies, when you add the free channels received on motorised systems such as movie channels in English, SPORTS, documentaries, general entertainment, kids tv, music channels, news & business, adult & culture & the constant stream of 1000s of outside broadcast feeds, this adds up to a massive selection of Free channels which can then be added to with a real life choice of channels from the many subscription packages. This section covers a breif history of satellite motors big & small & their development from the early home made motors [& home made satellite dishes] through various voltages eg 24v / 36v high power/ amperage versions & control systems, to todays 36v systems for bigger dishes & smaller, quieter diseqc 1.2/1.3 usals motors for small dishes to track 50-60 or more satellites & increasing year on year with up to 100 times the payload of even the largest broadcasters platforms, all through a small, simple to use, compact satellite motor & dish with easy to use receivers. Choosing A Good Satellite Motor. 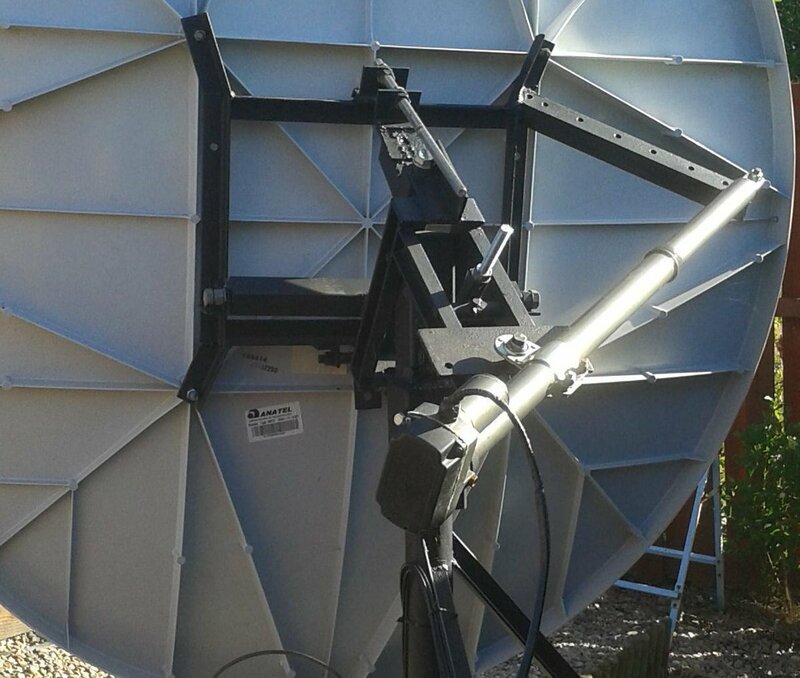 We spend a lot of time testing satellite motors & all satellite equipment [MOTORS, DISHES, BRACKETS, COAX, RF CONNECTORS, CABLE CLIPS & TIES, WALL ANCHORS etc} & establishing & maintaining good products & good supplies & constantly reviewing the prpoducts we do use. Satellite motors can all look the same & suppliers, manufacturers & some pubclications & websites all claim their's is the best & advertise various maximum satellite dish size claims etc. but only with extensive & quite costly testing at purplesat & BCS Satellite Engineering over years can you really trust a reveiw. build quality - often motors are designed & built to a design off CAD & let down by poor manufacturing resulting in play on critical nuts & bolts & tensioners (a well known fault on certain motors is the tensioners & worm drive bolts not tightening) rendering an expensive motor next to useless. A too weak bracket design or weak tube for the dish to fit on will mean the motor will move position by bending or the tube crushing resulting in the angles being lost. Too sensitive regulator can cause the motor to stop working when it fails but a motor without protection can drive into a wall damaging the motor, dish, stb & even what iot drives into. Poor rust proofing usually isn't an issue & more aesthetically unpleasant rather than causing real weakness but on a coastal high salt air environment it could also be a cause for bracket failiure. Motor / Gearbnox / main gear & worm drive & mountings can only be tested long term but many good motors do last incredibly well over 5 yeart 10 years 15 years & we've serviced motors over 20 years. Most Satellite Motors we use today, including most satellite motors designed & built by BCS Satellites [ Engineering] &purplesat.com, are designed to track broadcast satellites on the GSO - [Geo-stationary Orbit or Clarke Belt] which is the sole orbit around the Earth that rotates the same as the Earth & thus satellites placed on it* are as though they are in a fixed position in the sky & so satellite dishes can be pointed to/ aligned to, any particular satellite on the GSO & tightened up to receive the signals from that satellite position & broadcasters can then broadcast television programs Direct To Homes [DTH] within the coverage area as well as their use for commercial to commercial transmissions, outside [filming] broadcast feeds and increasingly data transmissions for internet traffic too etc..
Satellite Motors for use on the GSO. Satellite motors designed for use on the GSO move the dish tracking the visible part of the GSO arc on that side of the Earth [eg 65-80east to 65-80west of where you are depending on motor & latitude being the absolute horizon limits at sea level or limits of the motor], moving from satellite to satellite, automatically altering correct linear polarization orientation for each satellite [this sounds far more complicated than it really is & is far more about the quality of equipment used & quality of installation practices than the basics of GSO tracking principles] & once a stored satellite position is reached, the satellite motor stops & the dish will stay aligned correctly to the satellite until moved to another. OF THE SATELLITE ARC [A BIG ARC]. On early motorised satellite dish systems we would typically expect 30-45 degrees east/west or up to 70-90 degrees total & a handful of satellites & hundreds to low 1000s of channels - that was analogue channels with one tv channel & a few audio channels carried on a single transponder- Sounds wasteful but it could handle MOTION far better than lossy based digital compression [& so far still could]. Nowadays purplesat acheive regular arcs of over 140 degrees, over 60 satellite positions or 100+ satellites & up to 15000 channels plus 100s of 1000s of outside & studio broadcast feeds. Other types of satellites (not GSO) & there are far more that are not on the GSO, require different motorised systems [see motorised AZELs / LEO satellites etc..] & usually include fast tracking ability/ raster scanning etc. & are not usually used for direct to home satellite TV broadcasting [see also notes on RussianSoviet used Molniya 63.4 degree inclined cigar shaped orbits as a special case for more general boadcast use but not GSO & requiring constant real time tracking]. For the most part, the main concerns are satellites on the GSO for this article. Early GSO motorised satellite systems used a variety of systems & motors & voltages & amps to drive the dishes & later, track positioning of satellites including variable resisters/ pots to show the position as a higher or lower resistence from say 0 to 1000 ohms & was quite accurate but prone to variations due to weather / temperature conditions altering resistence. This eventually gravitated to the main system used today using 36v DC with a high geared wheel off the main drive motor with magnets in the wheel & a magnetic switching reed switch enclosed in glass close to it to open & close with the passing of the magnets in the wheel to track the position in clicks of ON/OFF states. This uses 4 extra cables to the motor, 2 for poiwer, 36v DC 3-5A & 2 for the reed switch on/off sync (5v 100mA). They are capable of moving dishes up to 3m ~ 5m**. There is an optical version of the reed sensor design, it works in much the same way as a reed switch, but uses an optical sensor & can have more accuracy but requires an extra wire for power & a 5v DC power supply & often called 5 wire, but has been adopted less at domestic level. WITH CHANNEL MASTER 1.2M BROADCAST STANDARD SATELLLITE DISH. 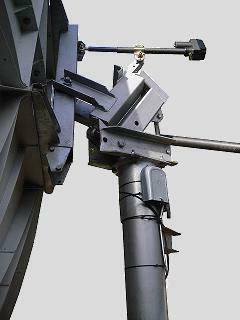 36v Motorised Satellite systems today are usually based on the mechanical polarmount design using a 36v actuator similar looking & action to a hydrolic jack, but using an electrically powered scew based jack design to drive the polarmounts from satellite to satellite in a linear to circular motion. This design can be very powerful & drive large satellite dishes but can have issues to acheive the largest arcs on one side. There are or have been many horizon to horizon 36v motors, usually for smaller dishes of 90cm to about 1.8m [at a stretch] usually based on a motor/ gearbox/ worm drive & main gear design with some exceptions such as the Fibo dedictaed motor. The 36v motors are drive by either receivers with 36v control or diseqc 1.2 to 36v interface boxes eg V Boxes/ G Boxes etc.. & several other products & stand alone controllers. Both Actuators & HH Motors usually use the reed sensor design to measure the travel & the 36v controllers then can record each satellite position as a number of simple clicks of the reed switch to determine the position of the dish on the GSO. A CHANNEL MASTER 1.8M ON A STRONG STEEL CUSTOM POLARMOUNT WITH HEAVY DUTY BEARINGS & GENUINE 24" HEAVY DUTY JAEGAR SUPERJACK 36V ACTUATOR POWERED BY A G BOX 36V CONTROLLER FROM DISECQ 1.2 SATELLITE RECEIVER . The actuator is driven by a powerful 36v motor & gearbox to a screw threaded driving ram tyhat pushes the polarmount round it;s pivot bearing thus scribing an arc in the sky to track the geostation orbit arc from that location. Inclined Orbit Satellites [that are on the GSO]. Inclined orbit satellites that are ON the GSO are basically faulty &/or are old &/or low on fuel & can be maintained with the minimum of fuel to extend their useful life for use in commercial to commercial / broadcast to broadcast use & not DTH [direct to home] use with broadcasters using motorised dishes that can track inclined orbits up & down. Inclined orbit satellites move up & down on a daily basis from the perspective of the Earth, but they are actually leaning (inclined) & often turning on the lean like a slowing spinning top, so their longitude remians correct on the GSO [the longitude 'has' to be maintained] but their orbit travels at an angle to the GSO, crossing the GSO twice a day & then moving above or below it until they become too inclined or unstable or too low on fuel, they always need enough fuel left at the end of their life to dispose of safely. An inclined actuator can be added to allow some movemant up & down for fine tunning, tracking inclinded orbit satellites & moving to other LNBs such as between C Ku Ka L X band etc.. & Linear Circular polarization. Diseqc 1.2 small motor control was later created from or added to the diseqc 22kHz signal protocal for smaller dishes to use smaller, quieter electric motors with small gearboxes & a basic, but proven worm drive to main gear design using only the power normally used for the LNB, eg 13v-18v @ 350mA & for dish sizes up to 1.1m 1.2m or even light 1.4m dishes & using the same single coax to carry the satellite signals at L Band, 22kHz signals for band & diseqc control and 13v/18v DC @ 350mA (later 400mA). [**maximum sizes depending on all factors of weight/ wind loading/ wind speed & pressure exposure locations versus sheltered locations / gearing etc..]. Early Diseqc 1.2 motors such as the early Jeagar SuperJack & early STAB Diseqc motor were just that & didn't haveUSALS / diseqc 1.3 compatability[see next section]. The diseqc motor was then semi automated with Goto X & then U.S.A.L.S which calculates the satellite's positions from the longitude & latitude of the motor's location & uses diseqc 1.2 calibration from the reed or optical sensopr to correctly send the diseqc motor to the approproiate USALS calculated satellite position regardless of where the satellite is on the GSO or where the dish is installed on the Earth. A program writen in 20 minutes so claims the author at STAB satellite motors Italy who still retain the rights to USALS so that all equipment has to be tested & approved by STAB to hold the USALS badge & menu options - some better satellite receivers such as Technomates do have the official STAB USALS logo on the front of their non Linux receivers- we don't know of any satellite motors that do have STAB USALS approval other than their own - a case of sour grapes we think, so all other motor manufacturers have to use a reverse engineered version often called Diseqc 1.3 as do many satellite receiver & PC card manufactuers. Most work OK, some not so & knowing who to avoid is aprt of experience. AZEL Satellite (& Space Tracking) motors move east & west (or left & right) & up & down & can see any part of the sky [visible from that side of the Earth to all horizons] but when used for satellite, they have to be controlled with a positioner that also applies alterations to LNB skew for each satellite if linear polarization. These are not 100% ideal for tracking the GSO but do allow tracking any position in the sky and with a professional controller, will perform for broadcast applications as well as non GSO work & used with space telescopes. Jodrell Bank (a close neighbour of our's) is a radio telescope designed on a large AZ EL design where the AZ (azimuth) movement is on a large track on wheels that tiurns the whole reflector round & the EL (elevation) moves the dish up & down on a curved track. USING A MOTORISED AZ EL DESIGN ALLOWING FULL SKY SEARCH CAPABILITIES. THE DISH IS PARKED LOOKING STRAIGHT UP IN STRONG WINDS. Purplesat would actually love to redesign the motor control. There is the smaller Lovell 2 telescope in the shape of a Sky dish and several smaller dishes including cross country microwave communications using Channel Master dishes when renamed ASC Signal & the red lighening bolt logo. A unique motor design [photo to come] using a basic large gear / small gear rather than worm drive design and using optical sync requiring 5v to power the optical with equally novel bolts the the back of the dish face. The above is actually modified to a Channel Master polarmount - pictutre to comde of the Fibo motor. An amusing demonstration of the tracking of the Clarke Belt - one dish on top another dish that is then on a satellite motor tracking the arc. Inside a HH180 36v Satellite Motor. Typical main gear & worm drive motor design used in most satellite motors today. This design gives incredible strength like the strength of a nut on a bolt being easily turned but not moved up the thread, the teeth on the worm drive exagerate this aspect of engineering so even very strong winds won't damage the motor or gearbox. PRICES ABOVE 'PLUS' RECEIVER CHOICES BELOW. Music, Comedy, Entertainment, News & Business, adult & pretty much every subject. around the house or out & about. Pause live TV FF Rewind & timeshift.